No matter if you have multiple degrees lining your office walls or if you have none... you have a gift. It’s the gift of a mind that is capable of truly remarkable endeavors. Miraculous even. You see, your IQ doesn’t define you. Your salary doesn’t define you. Likewise, your level of fitness, your current career position, and your number of friends don’t define who you are either. Rather, greatness does exist within you. Incredible ability is there, just waiting to be tapped. You’re on the cusp of realizing fantastic achievements. And it’s all within your mind... and it’s all within your reach! Today, we have your answer. In anything and everything you do — from your fitness to your finances — you can expect entirely new levels of personal achievement. What does it take to reach this awesome level? Would you believe just 5 minutes a day? It’s true. It’s clinically proven, and it’s real. And it’s all done by combining an extraordinary approach backed by 11 leading experts with the greatest tool in the history of the world — your mind. Your highest potential reached in the time it takes you to read this email. Flexibility in your hamstrings allows you to touch your toes. When your arms are flexible, you can touch the middle of your back. And flexibility in your brain allows you to touch every important part of your life — from your career and your salary, to your health and your happiness, to the relationships you keep and the accomplishments you achieve. EVERYTHING! It's the single most important thing in our lives. Yet most of us PRACTICALLY IGNORE IT! Today I’m excited to share with you a proven way to improve your life by simply introducing powerful techniques that will “flex” your brain. You see, when you correctly engage your brain, it becomes “flexible.” What happens next is quite remarkable. It begins to form an endless variety of new neural connections and pathways... in other words, it literally grows. And when your brain grows, you grow. Once that happens, you begin introducing one brilliant idea after another in important meetings. You complete an accomplishment that once seemed impossible, like finishing a marathon or a major home repair without help. But there’s also another side. If stimulating or “flexing” the brain makes it grow, any guess as to what happens when you fail to flex your brain? Right. It literally shrinks. Your new neurons die UNLESS they are used! That’s precisely why I’m sending you this email today — to make sure that won’t happen to you. Which is why I’m introducing the 5-minute-a-day solution to always flexing and growing your brain — and never shrinking your brain and your opportunities. I’m proud, in fact, beaming with pride, to introduce a Nightingale-Conant program that offers anyone the possibilities of starting fresh by not just enhancing minds, but also by enhancing people’s lives. It’s called The FlexBrain Method: Stimulate Your Mind and Energize Your Life. As a first-rate mind enhancement solution, The FlexBrain Method stands alone. For starters, it doesn’t require any complicated technology. You don’t even need to spend hours learning a newfangled system. All you need is 5 minutes (anytime and anywhere will do), an average mind, and a desire to improve your life. And because this program is produced by Nightingale-Conant’s internal research “think tank,” you aren’t limited by the expertise of one author. In fact, The FlexBrain Method features the latest research into brain function, memory retention, and neuroplasticity from 11 of today’s leading experts! Simply put, The FlexBrain Method is a state-of-the-art program designed to substantially improve your brain functioning right now, and keep your brain on an upward track of growth, expansion, and strength for the rest of your life. All the way to 80, 90, 100 years or more! But the real heart of The FlexBrain Method s the “neurobic workouts” at the end of each session. Each one is designed to optimize specific brain functions. They take just a few minutes to do. And the results will astonish you. BUILD muscle strength... without ever moving a muscle. How to practically leap from one career promotion to another by communicating to the RIGHT people in the RIGHT way. How to give your mind the nutrition it craves — add these 21 brain-boosting foods to your diet today! The single BEST thing you can do for your brain. Totally unexpected, yet AMAZINGLY easy. The single WORST thing you can do for your brain. Chances are, you've already done it today. An easy way to reduce your risk of dying from heart disease by 40%. This is something you can begin doing immediately! 5 supplements proven to increase neural connections in the brain. Please don't deprive your mind of these amazing memory-strengthening nutrients. How to put an end to migraines forever! These ultra-intense headaches can bring your life to a screeching halt... but no more! The secret to building muscle strength without ever moving a muscle. It sounds like something out of a science-fiction novel, but it works! Why you don’t ever have to experience stress again. You can easily “trick” your brain into thinking a stressful event isn't stressful (you don't have the stress response then). Years ago, when I finally committed myself to a regular physical workout routine, it was really tough. The exercises were exhausting and often left me aching and sore. Today, I've come to look forward to my workouts, and the results have been worth it. What a regular exercise routine will do for your physical fitness is exactly what the FlexBrain “neurobic” workout will do for your mind. But what's so amazing about The FlexBrain Method is that it is SO DARN EASY. When something so simple and virtually effortless can make such a huge difference in your life, in so many ways, you really owe it to yourself to try it out. A sharp, healthy, active mind is the single greatest asset you have. And the power to achieve and maintain that kind of mind rests with you. Take action now to guarantee yourself a lifetime of vibrant mental health and all the rewards that go with it. 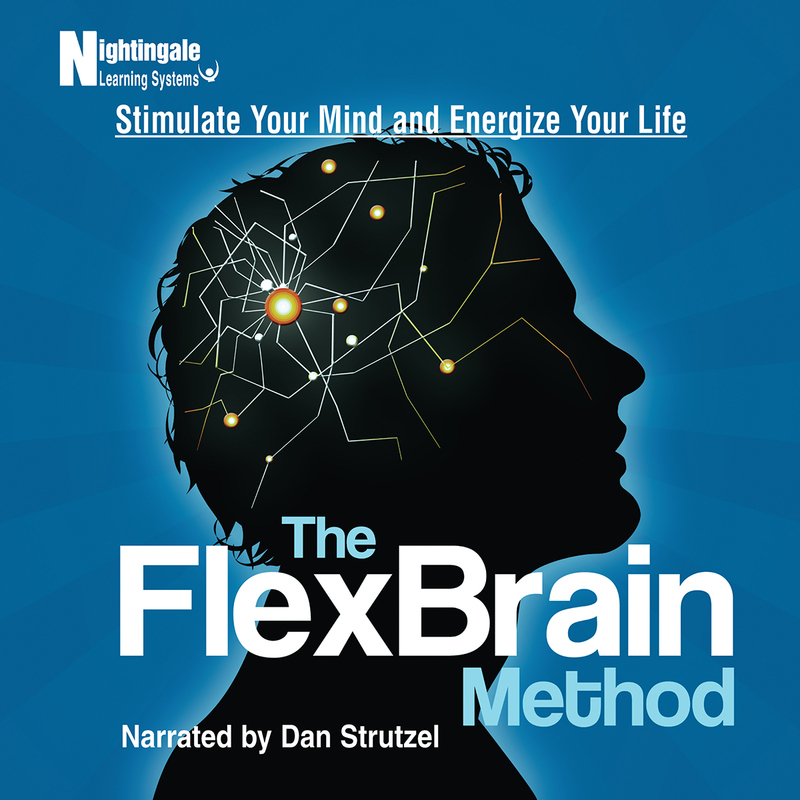 Order The FlexBrain Method today! P.S. Every second of the day, you use your brain. Can you imagine the impact it could have on your life if each of those seconds were the most efficient and most productive? By literally growing your brain and developing a sharper mind with The FlexBrain Method, you may be able to accomplish an entire day’s worth of priorities by lunchtime! And all it takes is just 5 minutes a day! my brain just 5 minutes a day! Please send me Nightingale Learning Systems's audio program The FlexBrain Method for the special price below. I can select one of two ways of ordering.